The dressing table in the interior of the bedroom has long been no longer perceived as archaism or some kind of excess. Modern designers and designers annually produce many convenient, compact and large-scale, roomy and laconic models, so it remains only to choose the best option for your taste and interior style. 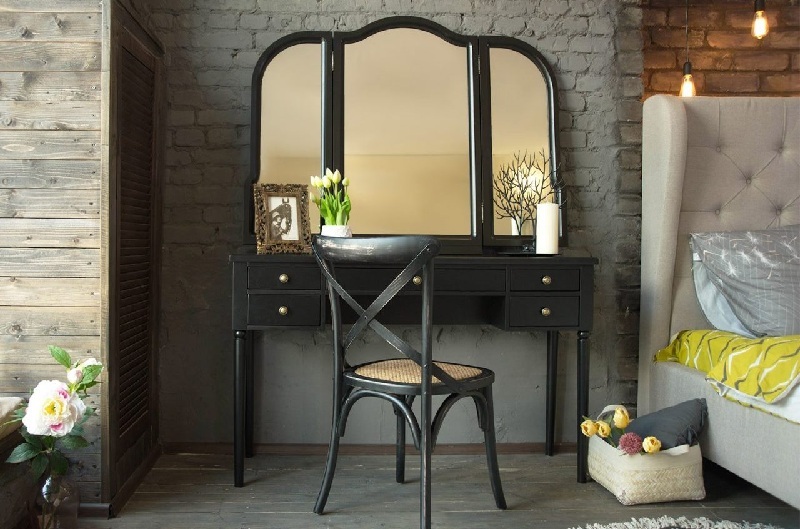 A dressing table in the family or girl’s bedroom is a really necessary thing because every woman needs a corner where she can keep her cosmetics, favorite perfumes, styling products, where she will be comfortable in removing and applying makeup, creams, masks, combing and selecting images. 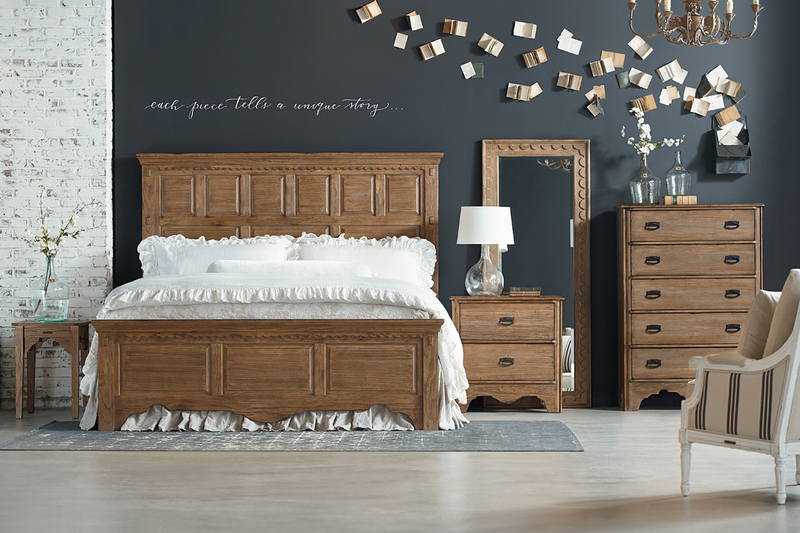 Let’s try to figure out how to choose a functional, beautiful piece of furniture that fits into the interior and layout of the bedroom. 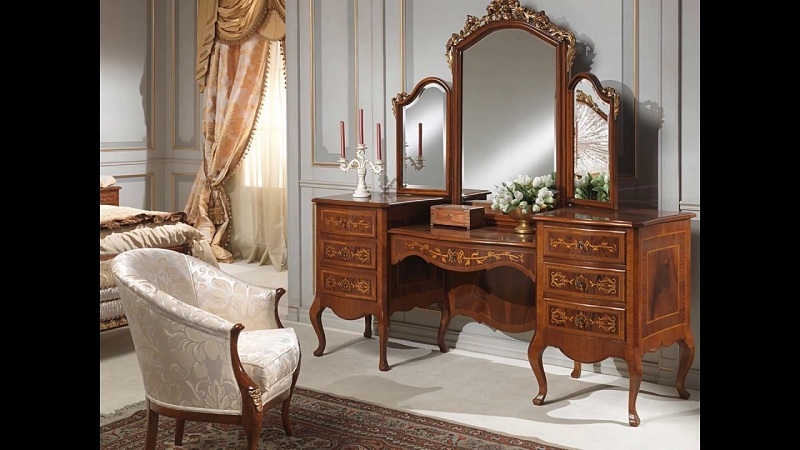 Before looking for a dressing table for the bedroom, it is necessary to determine the main varieties of this piece of furniture. All modern and antique models can be divided into several types: by design, by availability, mounting and types of mirrors, as well as by design (interior style, shape, color, material). Floor table is usually installed on four legs near the wall, window. Its size depends on the size of the bedroom and the needs of the future hostess. Many models are equipped with one or two drawers, drawers, additional shelves. Wall structures are usually already floor-standing, often have only two or three legs, are more compact, but can well accommodate a solid arsenal of cosmetics. Wall dressing tables fit perfectly into the interior of small bedrooms, they look tiny and weightless and do not occupy the precious area. Corner models, as in the photo below, are suitable for narrow and elongated, as well as for spacious rooms. They are so comfortable and roomy that they can serve as a workplace at the same time, and are also able to visually correct the geometry of the bedroom, making it more harmonious and correct. Particularly noteworthy model tables made to order. Their shape, design, and construction depend only on the wishes of the housewife and the designer’s idea, and the placement can be anything from a window sill to a closet. The pierglass is a three-leaved mirror, which is installed directly on the table, as in the photo, or can be bundled with it, making up a single whole. The main advantage of this option is the ability to look at yourself from different angles, both in profile and in full face. To assess the appearance of the hairstyle from behind, you will need an extra hand mirror. Trellis is an analog of the pierum, only in full growth. The presence of a table in such models is not provided, so the kit can be made independently by acquiring a compact console or tabletop with a cabinet, which can be placed before the trellis. 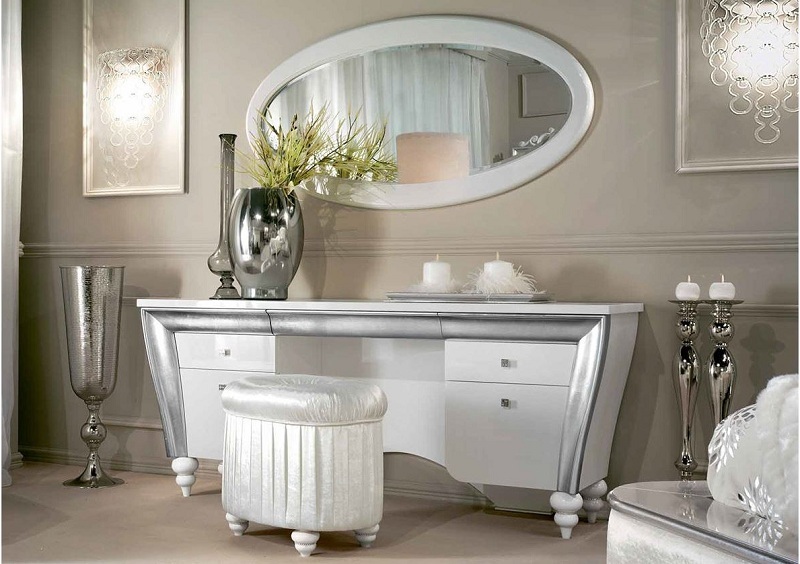 Classic bedroom vanities are usually fitted with a mirror that attaches to the countertop. There are also options with mounting to the wall. 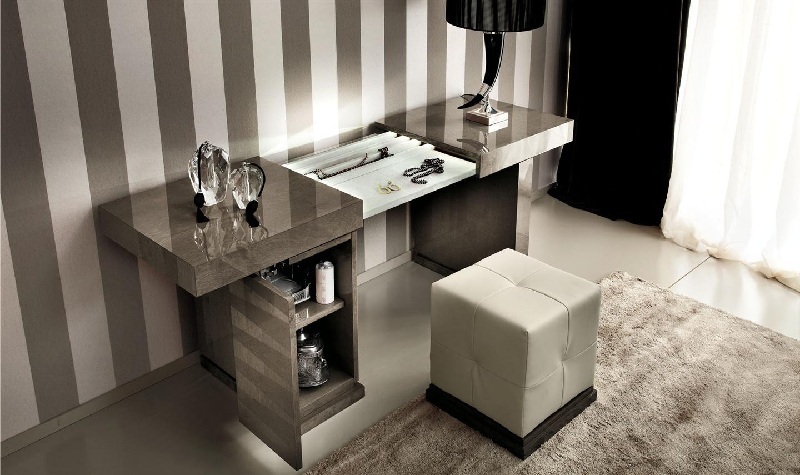 Compact and functional models for bedrooms in modern style are often equipped not only with drawers but also with a folding mirror-lid, under which there is a “little chest” for perfumes and cosmetic accessories, as in the photo below. 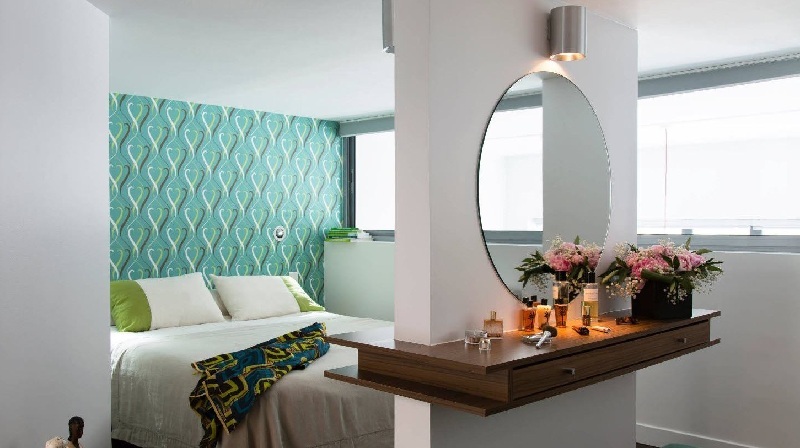 A foldable mirror can be purchased to any table, including a bedside table with a tabletop suitable height and get it as needed. A wall or floor mirror can be located directly behind the table or to the side of it, to occupy a large fragment of a wall or a small area at the height of the face of a sitting girl. How to choose a table for the bedroom interior? The table should be in harmony not only with the taste and character of the hostess of the bedroom but also with the size, geometry, interior of the room, with the rest of the furniture and decor. At the same time, you can make this object the main focus, different from the rest of the situation in color, design, shape or material. This technique is appropriate for eclectic interiors, accepting products from different eras, style, textures. For example, a retro table can perfectly fit into the Provencal, classic bedroom, in the interior in the style of loft, modern, shabby chic, rustic. Modern models are in better harmony with the styles of Art Deco, hi-tech, minimalism, Scandinavian design. 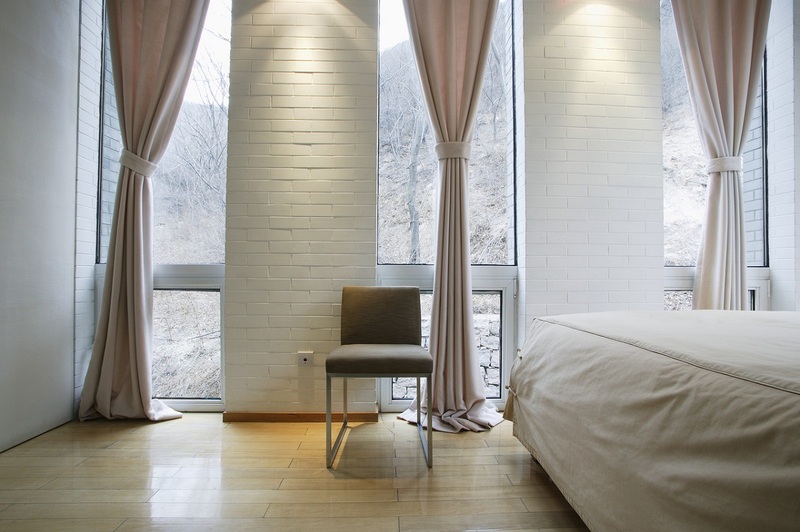 In addition to the style, one should take into account the color range, materials, forms of furnishing the bedroom, its decoration, and textile accessories. 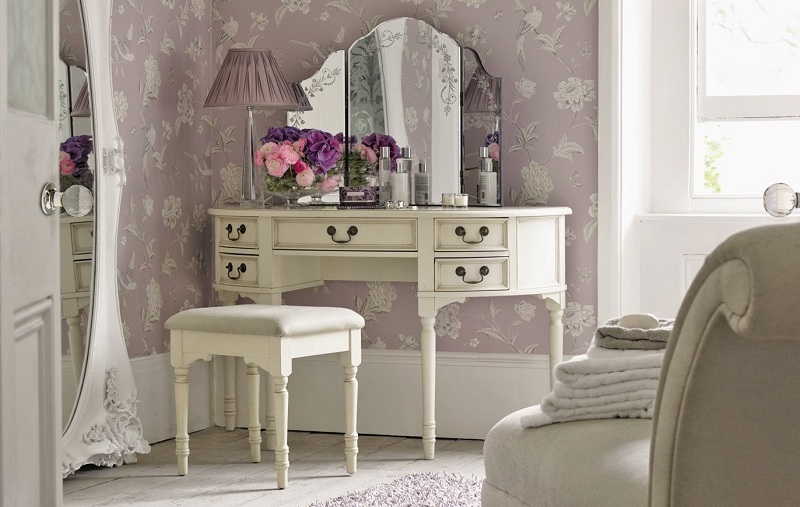 So, the classic wooden dressing table on straight or slightly curved legs, with elegant fittings, white with gilding or another light pastel shade will perfectly fit into the bedroom interior in neoclassical style, in the spirit of modern, Chebbi chic or even loft. A more elaborate vintage product made of natural wood will look great in English, Victorian bedroom. For an Art Deco interior, choose a table with a transparent glass top, mirrored nightstands, a fluffy white pouf, or a clear plexiglass chair and the same fur cushion. A mirror in a shiny frame completes the picture. 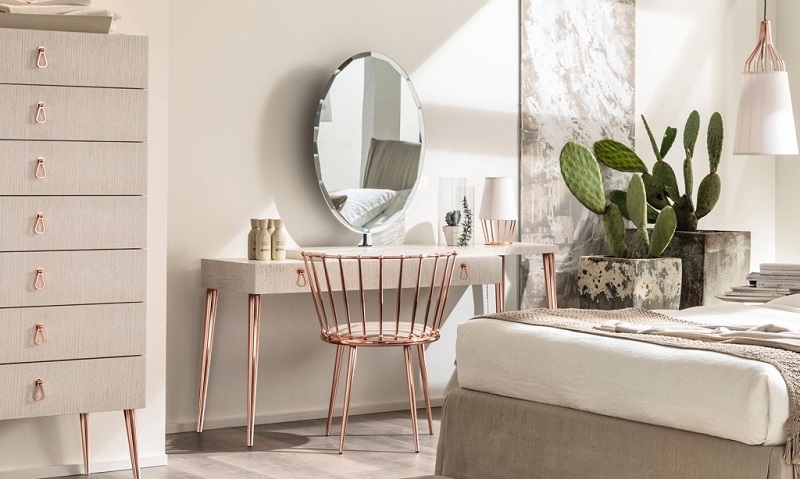 For a Scandinavian or minimalist bedroom, choose a concise model with a folding or sliding table top, and a high-tech room will decorate a weightless table on chrome legs with a glass table top. Elegant forged curls and a specially made old wooden table, painted with white paint, and a mirror in the same frame will complement the bedroom in the spirit of Provence and Chebbi chic. In the interior of the Art Nouveau style, a similar model would be appropriate, but a brand new one, gleaming with fresh varnish and black twisted cast iron legs. 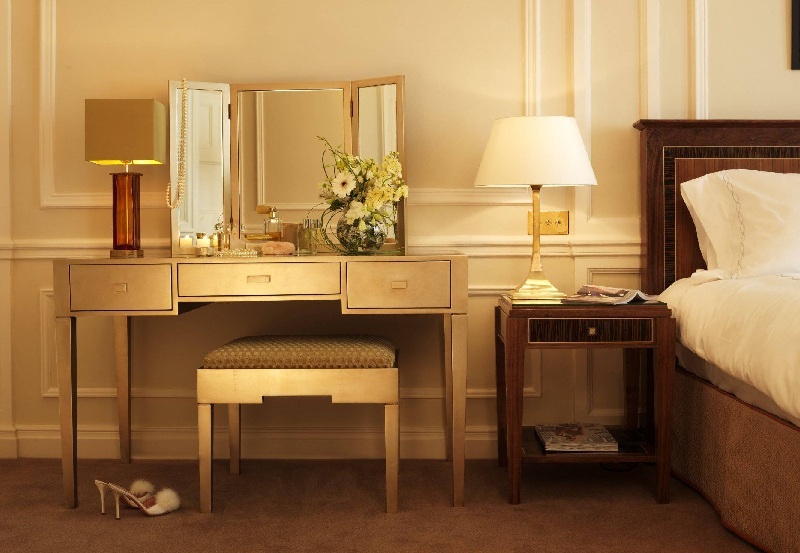 The location of the dressing table is usually due to the area of the bedroom and the availability of free space for its installation. Unfortunately, most women remember the need for this element after the repair, and they have to look for a place for it on their own, without the help of a designer. Since natural lighting is considered ideal for applying makeup, it is advisable to place a dressing table next to the window. You can move it close or build it into the window sill, – this idea will appeal to the hostesses of small bedrooms. 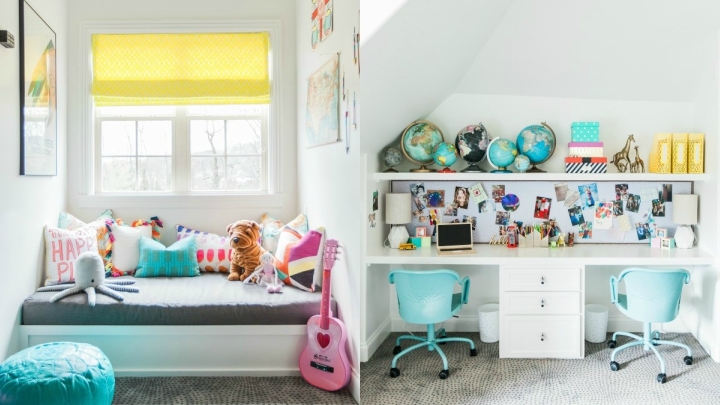 If the room has a pylon or partition that separates the bed from the rest of the space, from the back side a dressing table will fit in successfully, as in the photo. For small bedrooms, an option with a “corner of beauty” on the bedside table, chest of drawers will do. On sale there are original and very compact sets, where the chair moves under the table, forming a single whole with it. Hang a large mirror on a free wall, move a console or a small table close to it, pick up an ottoman – and your boudoir is ready! Use the niches in the room, the walls, the space between the cabinets. The console table, made to order or the size found in size, will perfectly fit into these spaces. 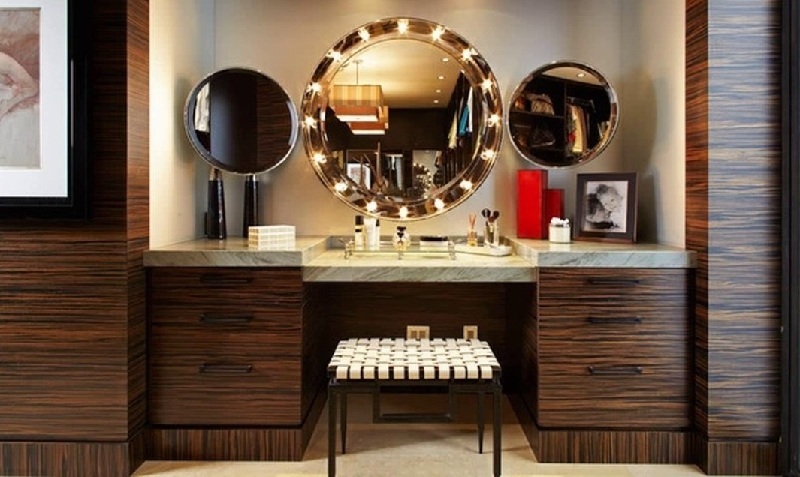 You can “hide” the dressing table in the bedroom interior by embedding it in a mini dressing room or wardrobe. Provide your “workplace” with convenient and proper lighting. Take care of table lamps, sconces, and directed rotating spots of daylight on both sides of the mirror above the table. A great option is a make-up mirror with bulbs around the perimeter (this is a good option for romantic bedrooms, art deco style interiors, pop art, and contemporary French chic with notes of Provence). For modern and laconic rooms, a mirror design with built-in LED lighting is suitable. The seating position is as much an integral part of the women’s corner as the right lighting. Choose a chair that is suitable in style, color, and design for a table or console, if these items are sold separately. At your service are padded stools, stools, chairs, and chairs from plastic, leather, metal, wood, and textiles. It is better if the seat is soft enough, especially if you spend a lot of time on makeup and styling. Cosmetics, perfumes, jewelry and other accessories are usually stored in boxes and boxes, without cluttering up the countertop. With such perfect order, you probably want to decorate your make-up room with something. This can be a vase with flowers, a pot or flowerpots with a flowering plant, ikebana, a beautiful table lamp, a jewel box, an elegant figurine are small stylish items that can be easily moved when you want to use the dressing table. Study photos from our selection, invent your ideas and choose the ideal option for your bedroom.